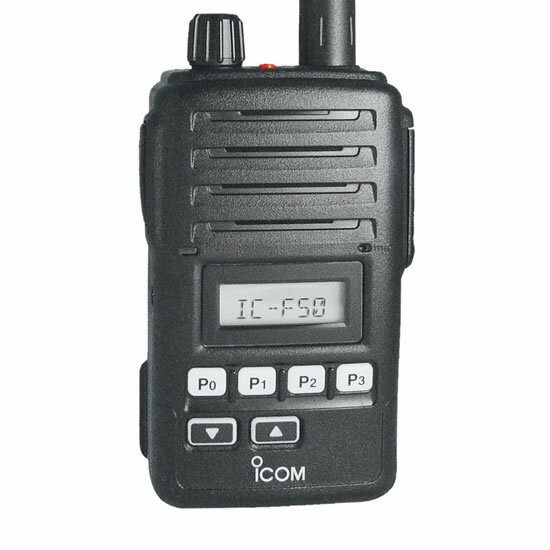 Icom two way radios are well known in the marine and coastal industries. Why are these so well known in these industries? That is because the F1000 and F2000, along with the F1000D and the F2000D are all waterproof, being able to be submersed to a depth of 1 meter for a maximum of 30 minutes, that means that these radios can be used confidently on a boat, ship or other water fairing vessel and be splashed around before it starts smoking and sparking everywhere! The IP67 waterproof casing means that it is made for total protection against dust and dirt and can withstand immersion between 15cm and 1m. When we talk about sound, we expect the highest quality of two way radios to have the best speakers producing the best output possible, but the icom website explains it like this âThe large 36mm speaker of the transceiver provides clear commanded 800 mW audio. The built-in BTL amplifier doubles the audio output power and delivers loud and intelligible voice to a radio operator working in noisy environmentsâ which basically means it produces some of the best sound out one of the smallest speakers on the market. So letâs go over the radios themselves, something that isnât so obvious is that they have split the frequency bands of the radios, the F1000âs is VHF only and the F2000âs is UHF. This is a brilliant idea from the guys at Icom, users often find it difficult to wade through a lot of the jargon of two way radios, so separating out the radio types into their respective bands goes a long way to remove the confusion. You may have noticed that there are 2 choices for each F radio, the F1000 and the F1000 D the D relates to the radios being digital compatible, meaning it can be programmed to be used on current digital systems as well used as a normal two-way radio. Analogue and Digital capable so that it can do both jobs or be ready for when you expand and move to a digital system. Over the years Icom have been consistent with their accessory connectors, a large range of their radios use the 2 pin connector, the only exception was the small multi connector that they introduced a few years ago. But these new F1000 & F2000 radios have been given their very own connector, very similar to the first generation but will not work with those radios, the new connector includes 2 holding screws . The range of F1000 radio earpieces is huge, with plenty to choose from, you will find any type of radio earpiece for these F1000 and F2000 radios. If you are looking for a waterproof radio used by many in the marine industry then the F1000 or F2000, depending on your frequency allocation, would be a great choice. It can be dropped to a depth of 1 meter for 30 minutes, so if you worry about splashes on your radio or it sitting in a pool of water on your boat, then you can be assured that it wonât damage this radio. With the latest technology and digital capabilities these are as modern as many counter-parts in the digital two way radio market.